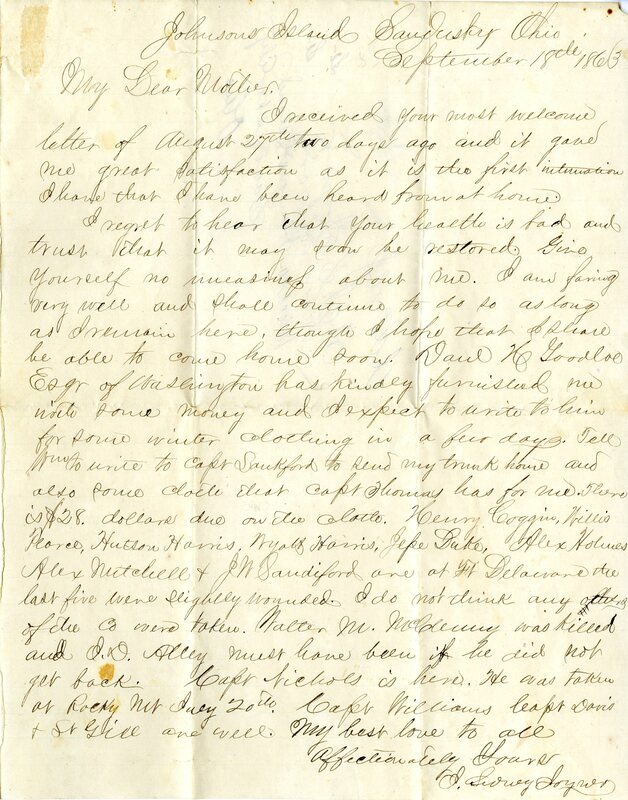 Item Description: Letter, 18 September 1863, From Julius S. Joyner to his mother Julia Joyner, updating her about himself and his fellow prisoners. During the Gettysburg campaign, Captain Joyner was captured and sent to Johnson’s Island near Sandusky, Ohio. Captain Joyner remained in Ohio until the close of the war, writing to his family of his needs and his surroundings in the prison. Item Citation: From folder 13 of the Joyner Family Papers #4428, Southern Historical Collection, Wilson Library, University of North Carolina at Chapel Hill. I received your most welcome letter of August 27th two days ago and it gave me great satisfaction as it is the first intimation I have that I have been heard from at home. This entry was posted in Southern Historical Collection and tagged casualties, Joyner Family, Julius S. Joyner, prisoners-of-war, union prisons. Bookmark the permalink.